Show: Shows list of all profiles. ‘Classic Default’ is default DraftSight UI Profile. Here ‘Classic Default’ is default profile which is Active by default. Click on ‘+’ tab on right side to add new UI Profile called Workspace. Rename it as you want. I renamed it as ‘CadOasis’ and Maked it default by double click inside Active column. Now as we set name of UI profile and made it active its time to Customize it. Menu Bar, Toolbar , Elements we will see them one by one. 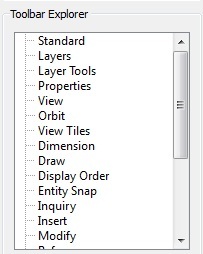 This menu bar is list of Visible menu items in DraftSight Window. Now that we have Create new UI Profile so no Menu Items attached to it, If you click Apply and Ok on Dialog box then you will see no Menu items in DraftSight window as your Active UI Profile is CadOasis. So Now we need to Add Menu items to this UI Profile. See Right tab next to ‘Menu Bar’ Column. Click on it it will expand dialog box and open List of Available Menu items, This is Called ‘Menu Explorer’. After Dragging Menu items which we want . I have added few Menu items for CadOasis UI profile. If you want to remove any Menu Item from ‘Menu Bar’ then Right click on that Menu Item, You can also add separator, Append Separator to Menu items. Toolbars: Now Expand Toolbars Section. Same as above Menu Bar we can Customize Toolbars and Add it ti new UI Profile . Also RMB options are same as Menu Bars. Elements: This is last and Important Section. You can customize Palettes in DraftSight Window. You can turn Them on or off from here. Just double click on cell under Palette column which you want to show. A green tick mark will show. If you want to turn it off then double Double click again . Finally Click on Apply and Ok of Customize dialog box. You will notice all Customized items and elements in UI Profile ‘CadOasis’. If yo want to change back to Classic default then go to UI profiles and Make it Active . End of DraftSight Basics Tutorial. Lets see DraftSight Premium Tutorial.